So…. carrying on with my cheeseburger phase. I am a BIG soup lover, especially in the winter. But I am one of those weird people who can eat a thick bowl of soup even in the middle of summer with no air conditioning in the house. One of the reasons I love soup is the amount of veggies I can sneak in without anyone (okay, me) even noticing. All of the flavors cook together and create such an incredible depth of flavor, but you often can’t really pick out any one veggie from the mix (unless it’s broccoli — I can ALWAYS pick out broccoli). This Cheeseburger soup, although it sounds kind of ridiculously indulgent, is actually full of healthy things. Lean ground beef, creamer potatoes (I used a 1.5lb bag of Baby Boomers from The Little Potato Company, but I think any of the Little Potato varietals would work just as well! ), carrots, celery, onions, chicken broth, and it’s made creamy with lot fat milk and just a tiny bit of flour. If you’re wanting to make the soup gluten-free, try replacing the flour with half the amount (1/8 cup) of corn starch and whisking it into the milk. This is one of those times when I threw a bunch of things into a pot, and was blown away by how good it was! It really is the perfect hearty and healthy soup for those chilly days. A lighter version of an old favorite! The slow cooker makes this Cheeseburger Soup so easy -- and you can prep everything the night before. In a medium skillet over medium high heat, cook ground beef and onion until beef is browned. Add garlic and cook 1 minute. Place beef in the slow cooker. Add potatoes, carrots, celery, chicken broth and salt and cook on low for 8 hours or high for 4 hours, until potatoes and carrots are tender. A lighter version of an old favorite! 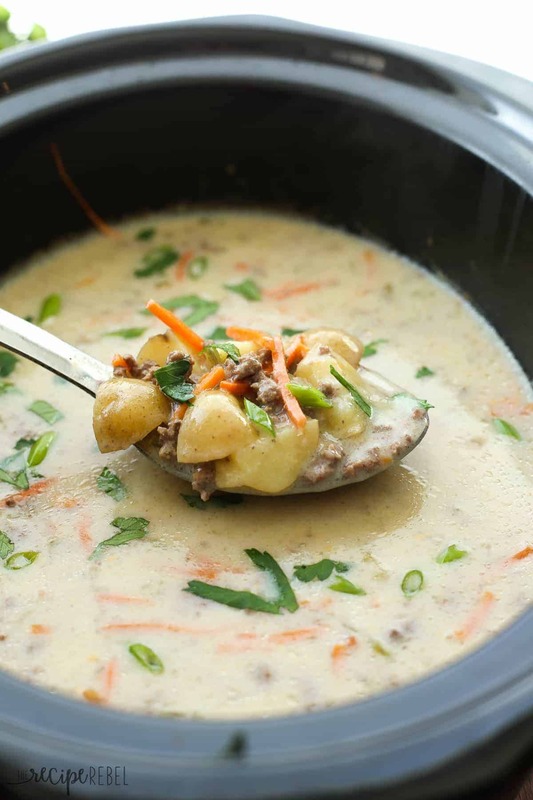 The slow cooker makes this Cheeseburger Soup so easy — and you can prep everything the night before. 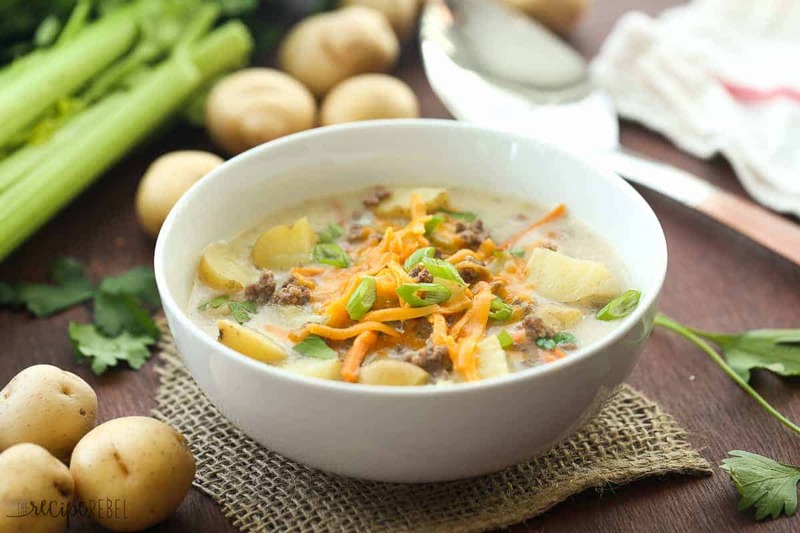 You can prep the soup ahead by adding the cooked ground beef and onions, along with potatoes, carrots and celery to the slow cooker the night before and storing in the fridge. In the morning, simple add the broth and start the slow cooker! [br]*Nutrition information is estimated and will vary depending on exact serving size, types and brands of products used. 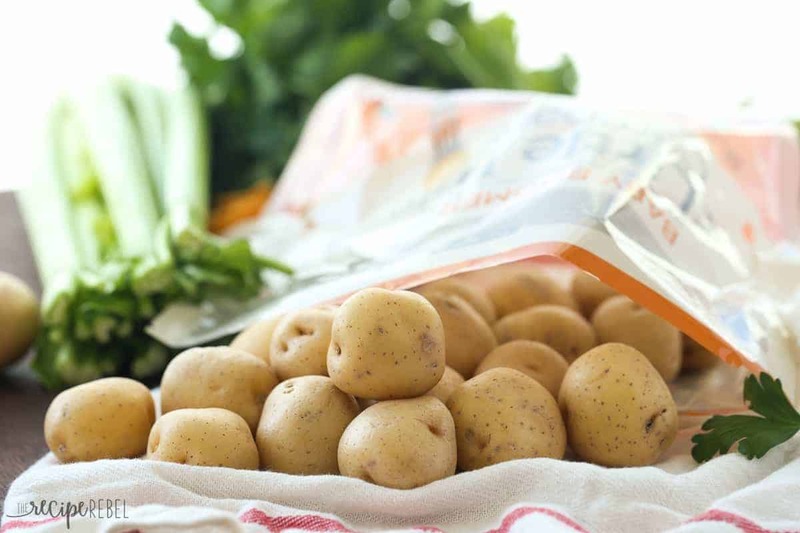 This post is sponsored by The Little Potato Company — thank you for supporting the brands that make The Recipe Rebel possible! More slow cooker soups to keep you warm! « Apple Crisp Smoothie & a KitchenAid Torrent Blender Giveaway! Thank you! I have been watching and waiting for a recipe similar to my cheeseburger soup that I normally make on the stove top, so I can try it in my instant pot on the slowcooker mode. My issue has usually been to be able to find one that is milk/flour base instead of cream, as cream bothers mine and my husband’s stomachs. And another bonus is that I can use the sauté mode for the first part. Keeping it all in one pot. I can’t wait to try this. One question, what size was your slowcooker? I’m so happy to hear that! 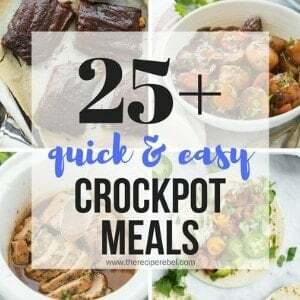 I’d love to hear how you like it 🙂 A 4-6 quart slow cooker will work best for this recipe! canned broth, chicken or beef, so that should bring the fat and sodium contents down and maybe the calories some more. Oh and ground turkey instead of beef. I just made this and it was delicious! I had to improvise though because I had NO chicken broth! I ended up using one can of beef broth and one can of cream of chicken soup with 3 cups of water. I also added pepper. We loved it so much I may not make it any other way! Thank you for the recipe! Oh that’s a great idea! Thanks for sharing! So this recipe has been up almost a year and no one has actually commented on the outcome,positive or negative, or with suggestions. It’s all the “sounds and looks” comments from other bloggers and followers. I wish the “sounds and looks” strokes messages could be put in one place and actual comments on the recipe in a different place. Don’t think I am attacking you. It’s a pet peeve of mine and I bet a ton of other blog followers agree. Let’s cut to the chase. is the recipe worth trying as is or with alterations, or not? Hi Laura! Yes, I have a lot of friends who are bloggers who leave comments and interact with me here. 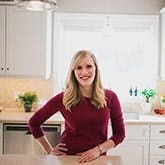 I would love if everyone who tried a recipe left a comment! Unfortunately, that’s not the case. I’d love for you to comment on anything you try from here! I just prefer the flavor and color that chicken broth gives it. Feel free to use beef if you prefer! Love that you lightened it up! This sounds like some great comfort food! This sounds awesome!! I love that you’ve got lots of potatoes in there for the french fries. 🙂 Can’t have a burger without fries! 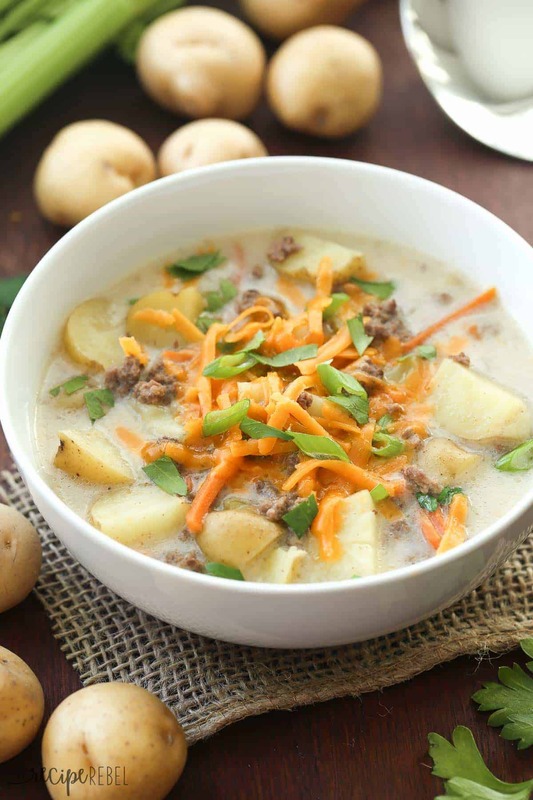 I never had cheeseburger soup growing up, but my husband had it all the time so this is his comfort food, I have got to make this! 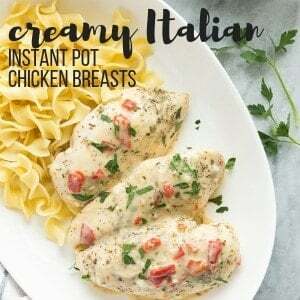 I love that it is a slow cooker version! oh my gawd, no you didn’t?!!! I love this! dang, looks so good!!! This recipe looks delicious! I don’t make soup often enough, I need to start! This looks SO comforting and delicious, Ashley! 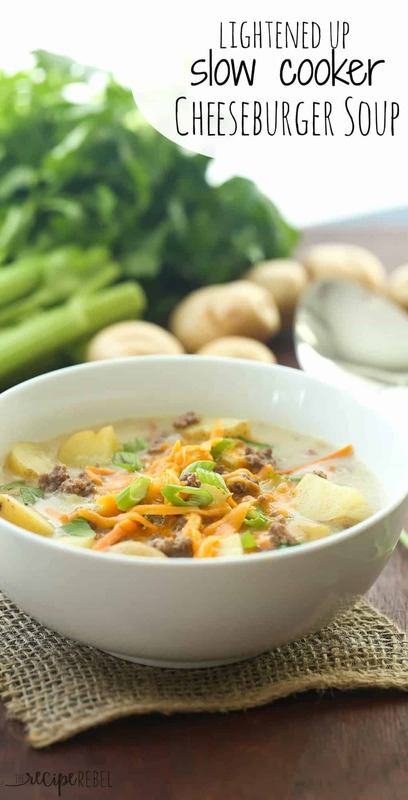 I can’t get enough of soup lately and with the freezing temps here this week, a hearty cheeseburger soup that’s lightened up sounds just perfect! I’ve never had cheeseburger soup and I think this lightened up version needs to be the place to start! I think my kids would totally be on board with this too! You are on a roll with the cheeseburger recipes! 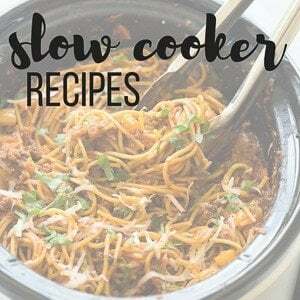 I love using my slow cooker, though I need to try it with more soups. Definitely perfect for the negative wind chills that are headed my way! Haha! Totally unintentional! But what can I say — I like meat and cheese! 😉 Thanks Gayle!